Be the first to share your favorite memory, photo or story of Guadalupe "Lupe". This memorial page is dedicated for family, friends and future generations to celebrate the life of their loved one. 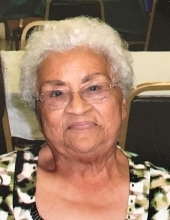 It is with great sadness that the family of Guadalupe (Lupe) Figueroa (born October 15, 1928) announces her passing on Thursday, March 28th, 2019 at Newaygo Medical Care Facility. Lupe Figueroa embodied commitment, loyalty and dedication to not only her family, but to every person who was blessed to meet her. Always welcoming everyone with an open heart and home, from a meal to a hug, her faith was undeniable. Lupe will be lovingly remembered by her family and friends. She is preceded in death by her parents Catalino Rodriguez and Valentina VillaVicensio, Lupita Cowham (daughter), Judy Figueroa (daughter in-law), Nancy Figueroa (daughter in-law) and Arturo Diaz (son in-law). She is survived by her children: Leopoldo Jr Figueroa (Dorothy), Ismael Figueroa (Annie), Rafael Figueroa, James Figueroa (Linda), Anita Diaz, John Figueroa (Noelle), and Santa Sokolowski (Corey). She has 21 grandchildren and 43 great grandchildren and 1 great great granddaughter. A memorial funeral service is planned for Saturday, March 30th at 11:00 am followed by a luncheon at St. Bartholomew Church, located at 599 W. Brooks St, Newaygo, MI 49337. For memorial contributions, please consider the Newaygo Medical Care Facility. Please share your memories of Lupe on the Tribute Wall. To send flowers or a remembrance gift to the family of Guadalupe "Lupe" Figueroa, please visit our Tribute Store. "Email Address" would like to share the life celebration of Guadalupe "Lupe" Figueroa. Click on the "link" to go to share a favorite memory or leave a condolence message for the family.